Pastoralism is the branch of agriculture concerned with the raising of livestock. It is animal husbandry: the care, tending and use of animals such as cattle, camels, goats, yaks, llamas, reindeer, horses and sheep. "Pastoralism" often has a mobile aspect but this can take many forms and be at different scales. Sedentary pastoralism is becoming more common as the hardening of political borders, expansion of crop agriculture, and building of fences reduces ability to move. Mobile pastoralism includes moving herds distances in search of fresh pasture and water, something that can occur daily or even within a few hours, to transhumance, where animals are moved seasonally, to nomadism, where pastoralists and families move with the animals year-round. In sedentary pastoralism, or pastoral farming, pastoralists grow crops and improve pastures for their livestock. One example is a savanna area where pastoralists and their animals gather when rainwater is abundant and the pasture is rich, then scatter during the drying of the savanna. . Another is the movement of livestock from summer pastures in lowlands, to montane pastures in the summer where grass is green and plentiful during the dry season  . Grazing in woodlands and forests may be referred to as silvopastoralism . Pastoralist herds interact with their environment, and mediate human relations with the environment as a way of turning uncultivated plants like wild grass into consumable, high quality, food. In many places, grazing herds on savannas and woodlands can help maintain the biodiversity of the savannas and prevent them from evolving into dense shrublands or forests. Grazing and browsing at the appropriate levels often can increase biodiversity in Mediterranean climate regions , . Pastoralists may also use fire to make ecosystems more suitable for grazing and browsing animals. For instance, the Turkana people of northwest Kenya use fire to prevent the invasion of the savanna by woody plant species. Biomass of the domesticated and wild animals was increased by a higher quality of grass. Pastoralism is found in many variations throughout the world, generally where enviornmental charactersitics such as aridity, poor soils, cold or hot temperature, and lack of water make crop growing difficult or impossible. 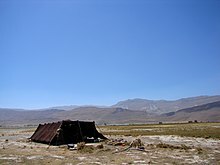 Pastoralism remains a way of life in Africa, the Tibetan plateau, the Eurasian steppes, the Andes, Patagonia, the Pampas, Australia, and other many other places. Composition of herds, management practices, social organization and all other aspects of pastoralism vary between areas and between social groups. Many traditional practices have also had to adapt to the changing circumstance of the modern world, including climatic conditions affecting the availability of grasses and the loss of mobility over large landscapes. Ranches of the United States and sheep stations and cattle stations of Australia are seen by some as modern variations. One theory is that pastoralism was created from mixed farming. Bates and Lees proposed that it was the incorporation of irrigation into farming which ensued in specialization. Advantages of mixed farming include reducing risk of failure, spreading labour, and re-utilizing resources. The importance of these advantages and disadvantages to different farmers differs according to the sociocultural preferences of the farmers and the biophysical conditions as determined by rainfall, radiation, soil type, and disease. The increased productivity of irrigation agriculture led to an increase in population and an added impact on resources. Bordering areas of land remained in use for animal breeding. This meant that large distances had to be covered by herds to collect sufficient forage. Specialization occurred as a result of the increasing importance of both intensive agriculture and pastoralism. Both agriculture and pastoralism developed alongside each other, with continuous interactions. There is another theory that suggests pastoralism evolved from hunting and gathering. Hunters of wild goats and sheep were knowledgeable about herd mobility and the needs of the animals. Such hunters were mobile and followed the herds on their seasonal rounds. Undomesticated herds were chosen to become more controllable for the proto-pastoralist nomadic hunter and gatherer groups by taming and domesticating them. Hunter-gatherers' strategies in the past have been very diverse and contingent upon the local environment conditions, like those of mixed farmers. Foraging strategies have included hunting or trapping big game and smaller animals, fishing, collecting shellfish or insects, and gathering wild plant foods such as fruits, seeds, and nuts. These diverse strategies for survival amongst the migratory herds could also provide an evolutionary route towards nomadic pastoralism. Pastoralism occurs in uncultivated areas. Wild animals eat the forage from the marginal lands and humans survive from milk, blood, and often meat of the herds and often trade by-products like wool and milk for money and food. Pastoralists do not exist at basic subsistence. Pastoralists often compile wealth and participate in international trade. Pastoralists have trade relations with agriculturalists, horticulturalists, and other groups. Pastoralists are not extensively dependent on milk, blood, and meat of their herd. McCabe noted that when common property institutions are created, in long-lived communities, resource sustainability is much higher, which is evident in the East African grasslands of pastoralist populations. However, it needs to be noted that the property rights structure is only one of the many different parameters that affect the sustainability of resources, and common or private property per se, does not necessarily lead to sustainability. Some pastoralists supplement herding with hunting and gathering, fishing and/or small-scale farming or pastoral farming. Mobility allows pastoralists to adapt to the environment, which opens up the possibility for both fertile and infertile regions to support human existence. Important components of pastoralism include low population density, mobility, vitality, and intricate information systems. The system is transformed to fit the environment rather than adjusting the environment to support the "food production system." Mobile pastoralists can often cover a radius of a hundred to five hundred kilometers. Pastoralists and their livestock have impacted the environment. Lands long used for pastoralism have transformed under the forces of grazing livestock and anthropogenic fire. Fire was a method of revitalizing pastureland and preventing forest regrowth. The collective environmental weights of fire and livestock browsing have transformed landscapes in many parts of the world. Fire has permitted pastoralists to tend the land for their livestock. Political boundaries are based on environmental boundaries. The Maquis shrublands of the Mediterranean region are dominated by pyrophytic plants that thrive under conditions of anthropogenic fire and livestock grazing. Nomadic pastoralists have a global food-producing strategy depending on the management of herd animals for meat, skin, wool, milk, blood, manure, and transport. 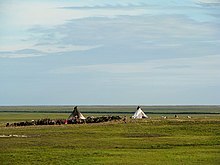 Nomadic pastoralism is practiced in different climates and environments with daily movement and seasonal migration. Pastoralists are among the most flexible populations. Pastoralist societies have had field armed men protect their livestock and their people and then to return into a disorganized pattern of foraging. The products of the herd animals are the most important resources, although the use of other resources, including domesticated and wild plants, hunted animals, and goods accessible in a market economy are not excluded. The boundaries between states impact the viability of subsistence and trade relations with cultivators. Pastoralist strategies typify effective adaptation to the environment. Precipitation differences are evaluated by pastoralists. In East Africa, different animals are taken to specific regions throughout the year that corresponds to the seasonal patterns of precipitation. Transhumance is the seasonal migration of livestock and pastoralists between higher and lower pastures. Some pastoralists are constantly moving, which may put them at odds with sedentary people of towns and cities. The resulting conflicts can result in war for disputed lands. These disputes are recorded in ancient times in the Middle East, as well as for East Asia. Other pastoralists are able to remain in the same location which results in longer-standing housing. 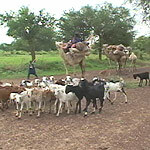 Different mobility patterns can be observed: Somali pastoralists keep their animals in one of the harshest environments but they have evolved of the centuries. Somalis have well developed pastoral culture where complete system of life and governance has been refined. Somali poetry depicts humans interactions, pastoral animals, beasts on the prowl, and other natural things such the rain, celestial events and historic events of significance. Mobility was an important strategy for the Ariaal; however with the loss of grazing land impacted by the growth in population, severe drought, the expansion of agriculture, and the expansion of commercial ranches and game parks, mobility was lost. The poorest families were driven out of pastoralism and into towns to take jobs. Few Ariaal families benefited from education, healthcare, and income earning. The flexibility of pastoralists to respond to environmental change was reduced by colonization. For example, mobility was limited in the Sahel region of Africa with settlement being encouraged. The population tripled and sanitation and medical treatment were improved. The Afar pastoralists in Ethiopia uses an indigenous communication method called dagu for information. This helps them in getting crucial information about climate and availability of pastures at various locations. Pastoralists have mental maps of the value of specific environments at different times of year. Pastoralists have an understanding of ecological processes and the environment. Information sharing is vital for creating knowledge through the networks of linked societies. Pastoralists produce food in the world’s harshest environments, and pastoral production supports the livelihoods of rural populations on almost half of the world’s land. Several hundred million people are pastoralists, mostly in Africa and Asia. ReliefWeb reported that "Several hundred million people practice pastoralism—the use of extensive grazing on rangelands for livestock production, in over 100 countries worldwide. The African Union estimated that Africa has about 268 million pastoralists—over a quarter of the total population—living on about 43 percent of the continent’s total land mass." Pastoralists manage rangelands covering about a third of the Earth’s terrestrial surface and are able to produce food where crop production is not possible. Pastoralism has been shown, "based on a review of many studies, to be between 2 and 10 times more productive per unit of land than the capital intensive alternatives that have been put forward". However, many of these benefits go unmeasured and are frequently squandered by policies and investments that seek to replace pastoralism with more capital intensive modes of production. They have traditionally suffered from poor understanding, marginalization and exclusion from dialogue. The Pastoralist Knowledge Hub, managed by the Food and Agriculture Organization of the UN serves as a knowledge repository on technical excellence on pastoralism as well as "a neutral forum for exchange and alliance building among pastoralists and stakeholders working on pastoralist issues". There is a variation in genetic makeup of the farm animals driven mainly by natural and human based selection. Pastoralists in large part of Sub Saharan Africa are preferring livestock breeds which are adapted to their environment and able to tolerate drought and diseases to mention the few. However in other animal production systems these breeds are discouraged and more productive exotic ones are favored. This situation could not be left unaddressed due to the changes in market preferences and climate all over the world, which could lead to changes in livestock diseases occurrence and decline forage quality and availability. Hence pastoralists are conserving farm animal genetic through community based conservation (CBC) of local livestock breeds. Generally conserving farm animal genetic resources under pastoralism is advantageous in terms of reliability and associated cost. Hardin's Tragedy of the Commons (1968) described how common property resources, such as the land shared by pastoralists, eventually become overused and ruined. According to Hardin's paper, the pastoralist land use strategy suffered criticisms of being unstable and a cause of environmental degradation. Pastoralists in the Sahel zone in Africa were held responsible for the depletion of resources. The depletion of resources was actually triggered by a prior interference and punitive climate conditions. Hardin's paper suggests a solution to the problems, offering a coherent basis for privatization of land, which stimulates the transfer of land from tribal peoples to the state or to individuals. The privatized programs impact the livelihood of the pastoralist societies while weakening the environment. . Settlement programs often serve the needs of the state in reducing the autonomy and livelihoods of pastoral people. The violent herder–farmer conflicts in Nigeria, Mali, Sudan, Ethiopia and other countries in the Sahel and Horn of Africa regions have been exacerbated by climate change, land degradation, and population growth. However, recently it has been shown that pastoralism supports human existence in harsh environments and often represents a sustainable approach to land use. ^ Schoof, Nicolas; Luick, Rainer (2018-11-29). "Pastures and Pastoralism". doi:10.1093/obo/9780199830060-0207. ^ Moran, Emilio F. (2006). People and Nature: An Introduction to Human Ecological Relations. Malden, Massachusetts: Blackwell Publishing. p. 52. ISBN 978-1-4051-0572-9. ^ Netting, Robert (1981). Balancing on an Alp: Ecological Change and Continuity in a Swiss Mountain Community. Cambridge, U.K: Cambridge University Press. p. 320. ISBN 9780521281973. ^ Plieninger, Tobias; Huntsinger, Lynn (2018). "Complex Rangeland Systems: Integrated Social-Ecological Approaches to Silvopastoralism". Rangeland Ecology and Management. 71 (6): 519–525. doi:10.1016/j.rama.2018.05.002. ^ Perevolotovsky, A.; Seligman, N.G. (1998). "The role of grazing in Mediterranean rangeland ecosystems -inversion of a paradigm". Bioscience. 48 (12): 1007–1017. doi:10.2307/1313457. JSTOR 1313457. ^ Huntsinger, Lynn. ; Oviedo, Jose (2014). "Ecosystem Services are Social–ecological Services in a Traditional Pastoral System: the Case of California's Mediterranean Rangelands". Rangeland Ecology and Management. 19 (1): 8. doi:10.5751/ES-06143-190108. ^ a b Lees, Susan H.; Bates, Daniel G. (1974). "The Origins of Specialized Nomadic Pastoralism: A Systemic Model". American Antiquity. 39 (2): 187–193. doi:10.2307/279581. JSTOR 279581. ^ "Hunting and Gathering Culture". Encyclopædia Britannica. ^ Moran, Emilio F. (2006-02-03). People and06. Malden, Massachusetts: Blackwell Publishing. p. 123. ISBN 978-1-4051-0572-9. ^ Ho, Peter (2000). "China's Rangelands under Stress: A Comparative Study of Pasture Commons in the Ningxia Hui Autonomous Region". Development and Change. 31 (2): 385–412. doi:10.1111/1467-7660.00159. ISSN 1467-7660. ^ Moran, Emilio F. (2006). People and Nature: An Introduction to Human Ecological Relations. Malden, Massachusetts: Blackwell Publishing. ISBN 978-1-4051-0572-9. ^ Moran, Emilio F. (2006). People and Nature: An Introduction to Human Ecological Relations. Malden, Massachusetts: Blackwell Publishing. pp. 51–52. ISBN 978-1-4051-0571-2. ^ Fagan, B. (1999) "Drought Follows the Plow", Chapter 11 of Floods, Famines and Emperors: Basic Books. ^ Ho, Peter (2003). "Mao's War against Nature? The Environmental Impact of the Grain-First Campaign in China". The China Journal. 50 (50): 37–59. doi:10.2307/3182245. ISSN 1324-9347. JSTOR 3182245. ^ Townsend, Patricia K. (2009). Environmental Anthropology: From Pigs to Policies. United States: Waveland Press. pp. 57–58. ISBN 978-1-57766-581-6. ^ a b c Wilson, K. B. (1992). "Re-Thinking the Pastoral Ecological Impact in East Africa". Global Ecology and Biogeography Letters. 2 (4): 143–144. doi:10.2307/2997644. JSTOR 2997644. ^ Roe, Emery; Huntsinger, Lynn; Labnow, Keth (1998). "High reliability versus risk averse pastoralism". Environment and Development. 7 (Dec): 387–399. doi:10.1177/107049659800700404. ^ "Farmer-Herder Conflicts on the Rise in Africa". ReliefWeb. 6 August 2018. ^ McGahey, D.; Davies, J.; Hagelberg, N.; Ouedraogo, R. (2014). Pastoralism and the Green Economy -- a natural nexus?. Nairobi: IUCN and UNEP. pp. x+58. ISBN 978-2-8317-1689-3. ^ a b Wollny, Clemens B.A (2003). "The need to conserve farm animal genetic resources in Africa: should policy makers be concerned?". Ecological Economics. 45 (3): 341–351. doi:10.1016/s0921-8009(03)00089-2. ^ a b Zander, K.K. ; Drucker, A.G.; Holm-Müller, K. (2009). "Costing the conservation of animal genetic resources: The case of Borana cattle in Ethiopia and Kenya". Journal of Arid Environments. 73 (4–5): 550–556. doi:10.1016/j.jaridenv.2008.11.003. ^ J., Philipsson; Ally, Okeyo Mwai (2006). "Global perspectives on animal genetic resources for sustainable agriculture and food production in the tropics". hdl:10568/3665. ^ Paiva, Samuel Rezende; McManus, Concepta M.; Blackburn, Harvey (2016). "Conservation of animal genetic resources – A new tact". Livestock Science. 193: 32–38. doi:10.1016/j.livsci.2016.09.010. ^ a b Hardin, Garrett (1968). "The Tragedy of the Commons". Science. 162 (3859): 1243–1248. doi:10.1126/science.162.3859.1243. PMID 17756331. ^ a b Fratkin, Elliot (1997). "Pastoralism: Governance and Development Issues". Annual Review of Anthropology. 26: 235–261. doi:10.1146/annurev.anthro.26.1.235. ^ Li, Wenjun; Huntsinger, Lynn (2011). "China's Grassland Contract Policy and its Impacts on Herder Ability to Benefit in Inner Mongolia: Tragic Feedbacks". Ecology and Society. 16 (2): 8. ^ "The Deadliest Conflict You've Never Heard of". The Foreign Policy. 23 January 2019. Fagan, B. (1999) "Drought Follows the Plow", adapted from Floods, Famines and Emperors: Basic Books. Fratkin, E. (1997) "Pastoralism: Governance & Development Issues". Annual Review of Anthropology, 26: 235–261. Hardin, G. (1968) "The Tragedy of the Commons". Science, 162(3859), 1243–1248. Angioni, Giulio (1989) I pascoli erranti. Antropologia del pastore in Sardegna. Napoli, Liguori. ISBN 9788820718619. Hole, F. (1996). "The context of caprine domestication in the Zagros region'". in The Origins and Spread of Agriculture and Pastoralism in Eurasia. D. R. Harris (ed.). London, University College of London: 263-281. Lees, S & Bates, D. (1974) "The Origins of Specialized Nomadic Pastoralism: A Systematic Model". American Antiquity, 39, 2. Levy, T. E. (1983). "Emergence of specialized pastoralism in the Levant". World Archaeology 15(1): 15-37. Moran, E. (2006). People and Nature: An Introduction to Human Ecological Relations. UK: Blackwell Publishing. Pyne, Stephen J. (1997) Vestal Fire: An Environmental History, Told through Fire, of Europe and Europe's Encounter with the World. Seattle and London: University of Washington Press. ISBN 0-295-97596-2. Townsend, P. (2009). Environmental Anthropology: From Pigs to Policies. United States of America: Waveland Press. Wilson, K.B. (1992) "Re-Thinking the Pastoral Ecological Impact in East Africa". Global Ecology and Biogeography Letters, 2(4): 143–144. Toutain B., Marty A., Bourgeot A. Ickowicz A. & Lhoste P (2012). Pastoralism in dryland areas. A case study in sub-Saharan Africa. Les dossiers thématiques du CSFD. N°9. January 2013. CSFD/Agropolis International, Montpellier, France. 60 p.